Image Credit: DoD photo by D. Myles Cullen, U.S. Army. The USMC’s top officer is uncertain about how much forward presence the U.S. needs in Asia. The top officer in the U.S. Marine Corps “doesn’t know” what his service’s Asia-Pacific force posture should look like in the future. 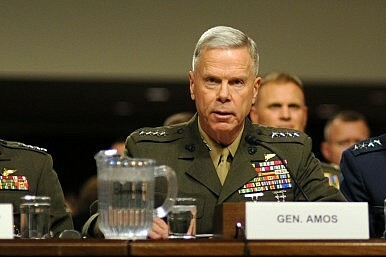 Gen. James Amos, the Commandant of the Marine Corps and a member of the Joint Chiefs of Staff, told a DC think tank audience on Tuesday that he doesn’t know what the U.S. Marines’ forward presence in Asia should be in the coming years. “How much is enough to be there?” General Amos asked rhetorically in response to a question about the role Asia will play in the USMC’s post-Afghanistan future. “Right now we are just trying to rebuild relationships,” he added, singling out Malaysia, Singapore, New Zealand and Thailand as examples of this. He also marveled at the fact that the U.S. and Vietnam are enhancing their defense cooperation despite the historical enmity between the two countries. Gen. Amos did say that President Barack Obama’s decision to place greater emphasis on the Asia-Pacific is the right approach in light of Asia’s growing importance to the global economy and the fact that five out of America’s seven major treaties are with allies in the Asia-Pacific. He also sketched out a broader vision of the role the U.S. should play in the region, arguing that many in Asia saw America as a stability link between different countries in Asia, particularly among Northeast Asian nations. He said he felt this was a good position to be in (U.S. Air Force officials seem to disagree). Still, he cautioned that it was important for the U.S. to decide which missions the military was best equipped to handle, and which could be better managed by civilian agencies. With regards to the former, Gen. Amos repeatedly returned to the important role the U.S. military (and presumably the USMC in particular) can play in responding to humanitarian disasters like the recent typhoon in the Philippines. On a couple of occasions he also noted that many countries in the region, like Japan and China, were heavily reliant on oil passing through the Strait of Malacca, suggesting that he felt this was an important area for the military to focus on. Returning to force posture, Gen. Amos implied he was in favor of the plan to disperse U.S. bases across the region, rather than relying on a few large bases that could be vulnerable to missiles. To that end, he expressed great admiration for Japanese Prime Minister Shinzo Abe’s handling of the thorny base realignment issues on Okinawa, and said he was confident that Abe would be able to overcome local opposition. He noted that many of the Marines coming out of Okinawa would be redeployed to Guam and Australia. Still it was hard not to get the feeling that Gen. Amos didn’t necessarily see the Marine Corps’ future as lying primarily in the Pacific. The event on Tuesday, held at the Carnegie Endowment for International Peace, was billed as a chance for the nation’s top Marine officer to “outline his vision of the post-2014 security environment.” In doing this, he seemed to be at least partially drawing on David Kilcullen’s recent work on future warfare. For example, Gen. Amos said the country and its military are at a “strategic inflection point,” before stating unequivocally that the USMC is not done with counterinsurgency (COIN). While not every single USMC engagement over the next 20 years will be an insurgency in the traditional sense, Amos argued that all would be fought “among the people.” Throughout the afternoon he repeatedly stressed the importance of this point for future USMC operations. The main sources of those conflicts, Gen. Amos argued, would be greater competition for natural resources, civil unrest, extremist ideologies and more frequent and devastating natural disasters. He cited France’s current military engagement in Mali as the type of conflicts he expects the USMC to be engaged in during the next two decades. The USMC will not be alone in upping its presence on the African continent.